The Great Gatsby by F. Scott Fitzgerald is an iconic text! Whether you have just finished reading the novel, or are planning your unit, these assignments will be engaging, meaningful, and instructive for your students. (For Tasks 1 and 2, there are A or B versions to provide students with choice and agency, or for yo to decide on the type or skillset you wish to target. 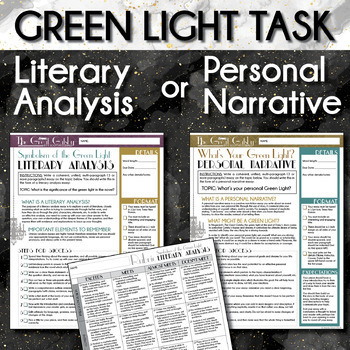 1A: Symbolism of the Green Light: Literary Analysis: The goal of this task is for students to write an analytical essay, examining the symbolism of the green light in the novel. It is an opportunity for them to practice writing a multi-paragraph essay, making unique, embedding evidence, & writing using a formal style. 1B: What’s Your Green Light? Personal Narrative: The goal of this task is for students to write a piece of narrative non-fiction: they will write a personal essay in which they explore what motivates them in life, the goals they are working towards. 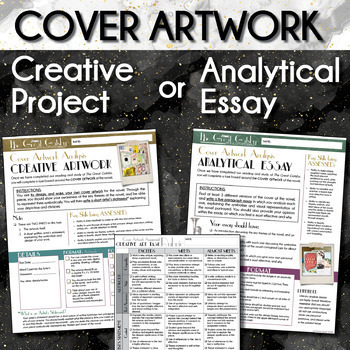 2A: Examining Multiple Covers: Analytical Analysis: The goal of this task is for students to write an analytical essay, examining key themes of the novel through symbolic representation of various covers of previous editions of the text. Students will select three covers, analyze & discuss them in light of the main themes & issues of the novel. 2B: Create Your Own Original Cover Project: The goal of this task is for students to think about the main themes and symbols of the text, and then be able to create their own artworks encorporating and displaying their understanding. They will also write a short artist’s statement in which they explain their work. 3: Final Exam / Quiz: The goal of this task is for students to demonstrate their knowledge of the novel through multiple-choice questions, short answer questions, and one longer essay. Not only does it assess factual recall, but it also assesses a students’ ability to write fluently, analyze the literature, and demonstrate their critical thinking. The Great Gatsby Lesson Plan Pack: A complete unit with pacing guide, daily lesson plans, worksheets, slideshows, and more! 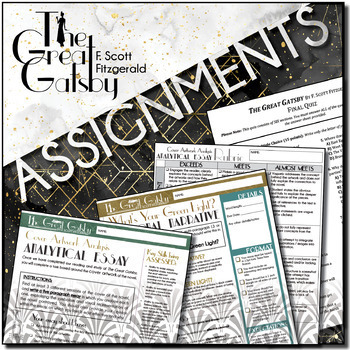 The Great Gatsby Student Workbooks: A comprehensive workbook resource for students; these were designed for differentiation in the classroom, to provide students with creative, engaging exercises for studying the novel. The Great Gatsby Posters: A set of posters with quotations from the novel. A great way to visually reinforce key lines from the text, and to brighten up your classroom walls.